Roche Abbey is situated in the valley of the Maltby Beck, around nine miles from Doncaster and thirteen miles from modern Sheffield. The site was enclosed by steep limestone cliffs and bordered on Bruneswald, later known as Sherwood Forest. This was a choice location for the monks: it provided privacy and solitude, as well as vital natural resources - water, woodland and stone. Whilst the setting was solitary, it was not remote. Extensive repair work was undertaken at Sheffield Castle in 1446-7. The fine limestone from Roche Abbey quarries was chosen for the reconstruction of the tower. The stone was transported by the tenants of John Talbot, lord of Hallamshire: 120 men with sixty wagons and their draught-oxen. This was boon-work, and although the men were not paid for their work, they were provided with bread, beer and other supplies. It was close to several thoroughfares, within a few miles of the River Trent, and near to the castles of Tickhill and Conisbrough.The magnesium limestone cliffs that bounded the abbey on the north afforded shelter, and also an identity, for the community took their name from these rocky surroundings: the monks of St Mary of the Rock (Roche). Woodland to the east provided timber and fuel, as well as pannage for the pigs. The Maltby Beck supplied water, an essential resource for the daily functioning of a self-sufficient community. 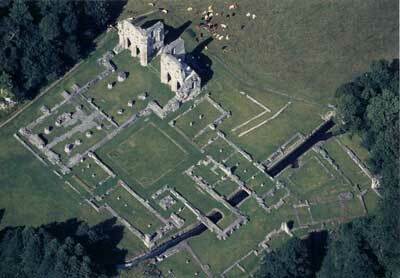 Stone channels directed water through the precincts; it flowed from west to east, bisecting the site: the church, cloister and inner court lay to the north of the Beck; the abbots lodgings, infirmary and outer court to the south. In May 1236 troops of knights, riding on horses and fully armed with shields, standards, helmets and coats of mail suddenly appeared out of thin air at Roche. Water was needed for a multiplicity of functions: drainage, cooking, washing, the cultivation of crops and the powering of mills; it was also used for liturgical purposes. The nearby quarries provided a ready supply of high-quality stone, which was easy to work with and durable. Contemporaries admired the fine masonry at Roche, and stone from here was transported for use elsewhere, including Sheffield Castle and Windsor Castle. Roche Abbey Stone is still quarried from here and considered a superior stone.